For over a decade, visitors have been coming to this idyllic sanctuary to practice the art of living off the land. Every afternoon the proprietress of Reverend Mother Gardens calls each of her dozen dairy goats by name, and they emerge from the surrounding redwood forest and trot into their pen. The goats provide milk, cheese, and manure, and are an essential element of life on this remote Northern California homestead. I am here at Reverend Mother Gardens, not to make my own cheese, kombucha, or compost, but to see how premium artisan cannabis is grown. I’m already a devotee of Reverend Mother’s Holy Diver flowers, which have recently become available at a handful of dispensaries through PremaFlora, a new line of boutique sungrown sourced from small farms in Northern California. Founder and executive director Jeff Jones describes PremaFlora as a “triple bottom line enterprise,” meaning that environmental and social impacts are prioritized alongside the economic bottom line. Jones, who comes from a background in microenterprise development and microfinance, created PremaFlora with an emphasis on fair trade and sustainability. Patients in San Francisco, Oakland, and Berkeley can now order directly from PremaFlora’s online farm stand. 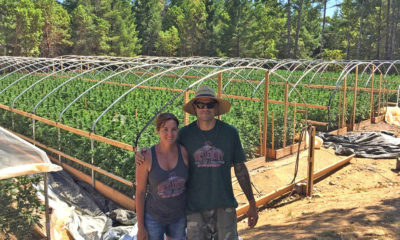 “With the farm stand, our focus is on telling the story of craft farmers, and helping folks really appreciate cannabis flowers the way they might fine wine, or coffee, or chocolate,” Jones explains. The online shop offers a selection of organically and sustainably-grown flowers from nine different farms, perfectly packaged in thick glass jars labeled with tasting notes, batch numbers, lab results, and farm profiles. Curated trios of eighths highlight female farmers, energetic or relaxing effects, citrus-scented strains, flowers from a single appellation, and connoisseur genetics. For those who want a little bit of everything, there’s the 9-gram sampler pack. Have you sampled any strains from this year’s outdoor harvest yet?